My father’s side of the family settled in Woodstock, New Brunswick. I’ve consequently spent a fair chunk of time there and am familiar with the overall vibe and basic geography of the town but not the local music scene. As a result, when I heard a bit about the band Morohubu, hailing from Woodstock and playing Rock/Funk/Fusion music, I was intrigued. I had the chance to sit down with their debut self-titled EP, released on August 9th, 2017, and was thoroughly impressed from start to finish. The opening track “Might Be Wrong” is a chill, soulful groove that gently introduces you to their overall sound. They follow by kicking up the funk on the second cut, “Get Up and Dance” which was a highlight for me. While I have to admit that I didn’t get up and dance myself, I grooved out about as hard as one can while remaining seated. Lead guitarist Steve Hubbard executes an expertly crafted guitar solo that clocks in at an epic 90 seconds and explores a range of dynamics, evoking a range of emotions. The half-dozen or so friends and family members that I have insisted listen to the track while I watch them have all also been duly impressed. The third track “Girl in 7b” is a funky lament. I can say with some confidence I have not used those two terms together in the past, but they most certainly apply here. The EP is rounded out by a return to harder grooves entitled “What We Want” that punctuates a really damned enjoyable 24 minutes of music. 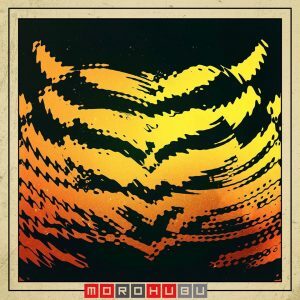 Morohubu is a tight-knit ensemble with a high degree of musicianship across the lineup. The lyrics are engaging and singable, and the grooves are tight. They have already started to make their way into the summer festival scene, and I am very much looking forward to see where things are heading for this project.If you think that some feelgood funky fusion rock might be just what you need in your day, this EP is a great way to spend some time. As I write this, I am completing my 5th or 6th listen to this production, and I think you’ll find yourself going back to it more than once as well. Or stream it on Spotify, and then go check them out live. I think you’ll be compelled to want to see them play these songs and in person. Follow me on Twitter and Instagram (@ColinFowlieNB) for more unsolicited opinions and let me know what your thoughts.